This entry was posted in Days at Home and tagged newspaper clippings, scrapbooks, shadowbox, wedding announcements. Bookmark the permalink. What a special gift and friend you are. What an incredibly beautiful way to create a very unique and special gift for your friends. Certainly the scrapbooks are a treasure trove of information and inspiration but YOUR creativity and eye for detail made that shadowbox a one-of-a-kind heirloom for your friend to keep, share and treasure always. You are SO talented!! I agree with Pam…..you are so talented as I’ve told you before. I knew Donna would love it. I think anyone would. What a wonderful quest! To see one’s history just given to you in such a beautiful way would make anyone emotional. One shadowbox at a time, one card at a time, one post every day, you make this world a better place. Your heart is full, Dianna. Aw, Georgette, you’re so sweet!! Thanks for the compliments! What a lovely idea and gift Dianna. I agree with June, anyone would love to have one of those. Such a sweet memory! WOW! You know I love this! What a significant, special use of your special talent!!! What a special and lovely gift. Your friends are lucky to have you. What a great keepsake! 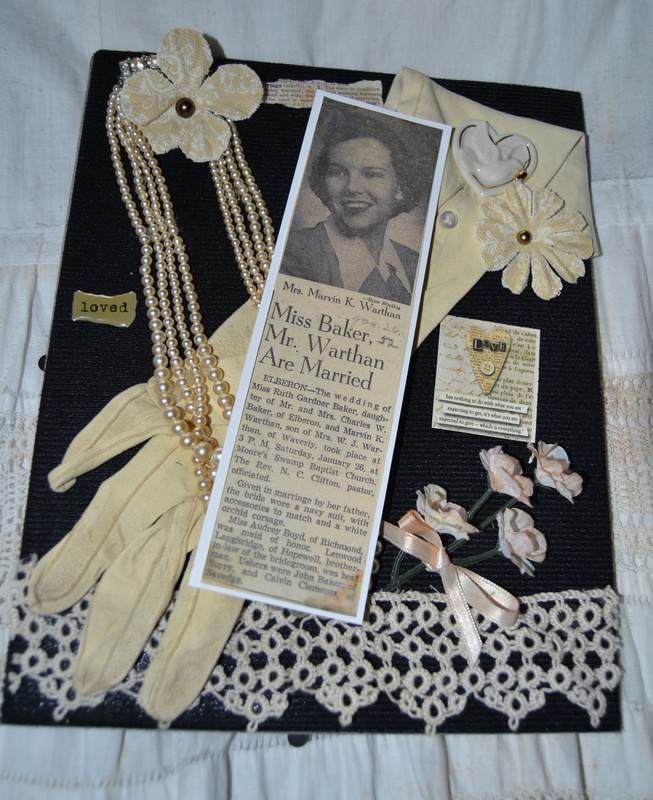 When my grandmother passed away in the late 80’s, my Aunt made a similar shadowbox for me using my grandmother’s sewing box contents with some of her doilies, white Sunday gloves and a few pieces of her costume jewelry. She made one for each of the grandchildren girls in the family. It’s such a great way to remember loved ones. I love it! Dianna what a wonderful gift for all of us! As one of the Warthan siblings I can vouch for all of us when I say we indeed loved and miss our parents very much so it is a very special thing that you did. Donna is lucky to have a friend such as yourself! I saw this on Thursday! It’s so perfect!! Thank you Dianna. Such a lovely gift and so thoughtful. You know how to do it up right. 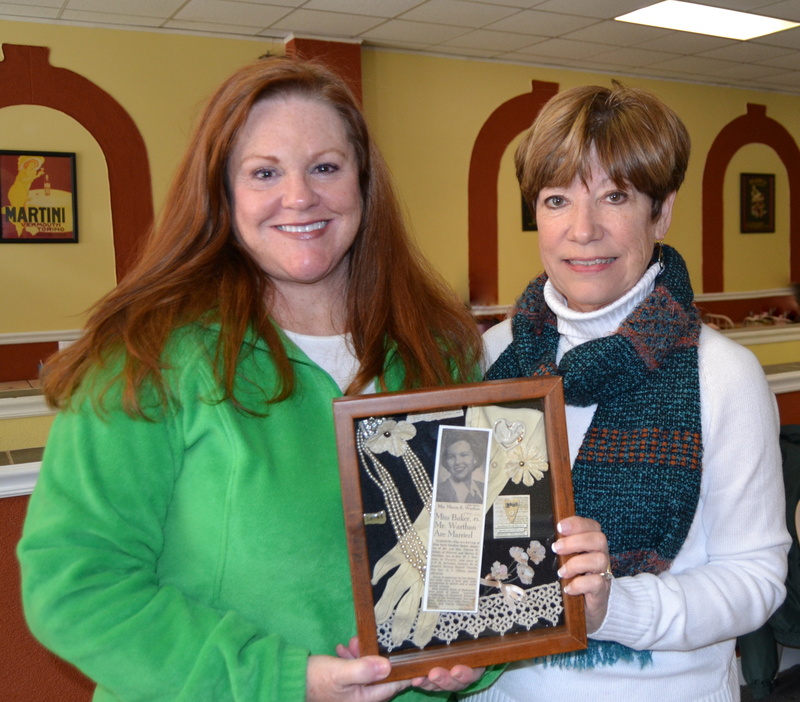 Dianna, words can hardly express the joy and flash of memories of my beautiful Mother when I saw the shadow box! Even in the picture of you and I (and the wonderful love box), you can still see the happy tears in my eyes. The time it took, the loving care and thought put into putting the box together (everyone especially loves the sweet old gloves), I (and my family) will always hold you close to our heart. It was a beautiful thing you did and i am eternally grateful to have a friend like you. Thank you for being such a wonderful friend. Gorgeous! What a wonderful random act of kindness and senseless act of beauty! WoW…what a wonderful, thoughtful gift!! it’s just gorgeous!! I can’t even imagine the joy Donna must have felt. Just one of the coolest things ever Dianna! Looks like lots of creative fun. What a wonderful idea and such a precious memory that you’re making. So thoughtful and kind of you! There is no better gift to give than of your time and talents and you gave both! You are such an exceptional and inspiring woman. Your kindness to others is so rare and precious in these crazy times. So lucky to be Motor Man’s and your friend! You guys are the best!! This gave me goosebumps! How incredibly thoughtful and talented you are. I might need to pick your brain about how to display something that is old and special to me. Next time we get together with Patti, I’ll bring it, assuming I even remember this! Oooh….I’d love to see it! We’ll have to plan a get-together soon! You were so very thoughful, I bet they were thrilled. I love making shadow box’s too. The shadowbox came out beautiful. I have such a talented aunt! I look forward to seeing you for my birthday lunch! Oh my goodness, what an absolutely lovely thing to do! A gift like that is one to be treasured for a lifetime. And what a neat idea for those old clippings. 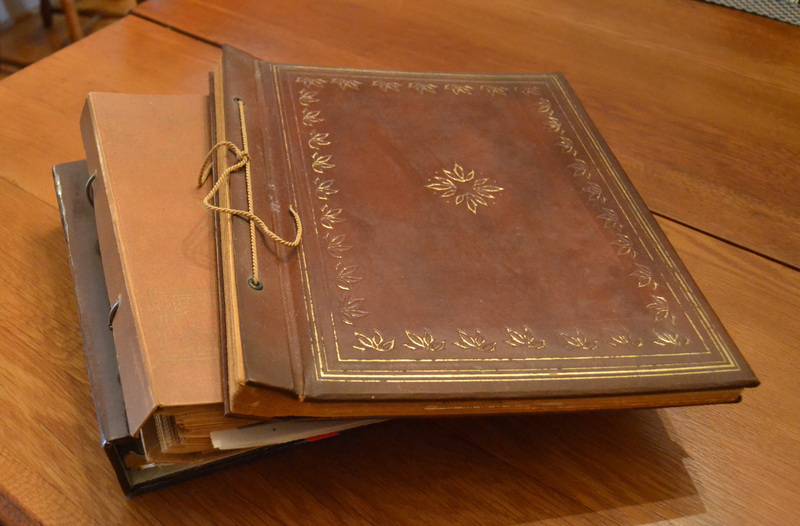 My mom also kept scrapbooks just like the ones you have with weddings and engagements in them. When she passed away, my sisters and I went through them and gave away clippings to children and grandchildren of the wedding couples portrayed. But I never once thought of doing something special like this with them. Your sweet and caring heart shines through your actions, Dianna! You are a treasure. What a beautiful, thoughtful gift. What a special friend and lady you are. You, yourself, are a special gift to your friends Dianna! And these gifts of memories you make for others will be cherished. This was such a beautiful thing to make and share Dianne! What a beautiful and thoughtful gift! You are so creative! What a sweet thing to do! I know this beautiful gift will be treasured always. You are simply the sweetest and most thoughtful friend a girl could have, Dianna! Blessings all over you today! What a lovely, thoughtful gift, Dianna! You are a treasure. What a lovely act of love you gave Donna. There are many angels on earth Dianna and you just prove that point to me more and more!